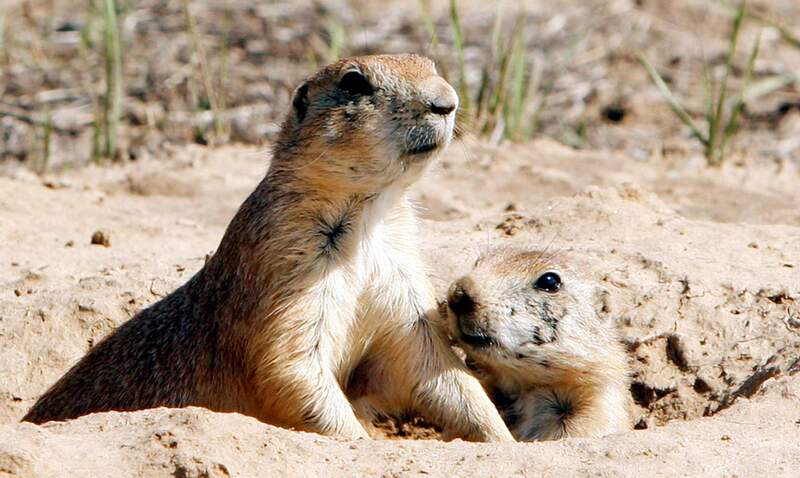 Prairie dogs will be there to greet visitors when Durango Nature Center opens this month. Even though we are weathering a few heavy March snows in Durango, spring is definitely in the air. One day it suddenly hits us that the chill is gone. Of course, that means we have mud season to look forward to until real spring arrives, but it is the time of year where even a big snow wont stay on the ground for more than a day. Bluebirds and swallows are returning, and soon crocuses will be lifting their heads. At the Nature Center, March is as muddy as can be expected. We have had it closed since November to rejuvenate. The end of March is when we open it for our spring volunteer training and spring school programs. However, before we get there, other inhabitants are stirring. Kids who visit the Nature Center in the spring and summer look forward to being greeted by our renters, a colony of prairie dogs that inhabit the land leading up to the entrance. As cars and buses drive into the center, prairie dogs standing and barking along the sides of the roads welcome them. March is the month that prairie dogs give birth, and by the end of the month, young prairie dogs will be running around celebrating the real arrival of spring. Prairie dogs are burrowing rodents that are very social. They are one of the most interesting species to watch because they are very affectionate and playful with each other. They also have many different sounds for communicating, including what looks like a kiss as a form of identifying each other. Prairie dogs form towns, or colonies, underground with as little as 10 members or as many as hundreds. Connected burrows are up to 7 feet deep and 16 feet long and usually consist of a male, several females and their offspring. They consist of different rooms, including nurseries, listening posts and even bathrooms. Several volcano-shaped entrances exist around a colony, which are formed to shed water and catch wind for ventilation. Prairie dogs are very efficient diggers. In fact, using their heads and shoulders, they can displace as much as 480 pounds of dirt when they form a new colony. Because of this, they are controversial in Colorado. They eat grass and disrupt farmland and ranchland; therefore, many colonies have been destroyed through poisoning or bulldozing. It is now thought that prairie dogs occupy only 5 percent of their original habitat in Colorado, although they are resilient and resourceful and continue to survive. It is also thought by many that they are a keystone species because their colonies create islands of habitat that benefit approximately 150 other species including coyotes, eagles, badgers and the critically endangered black-footed ferret. They even help aerate and fertilize the soil, allowing greater diversity of plants and insects. Additionally, colonies funnel rainwater into the water table, which helps prevent erosion. Given that we run a Nature Center, we look at them as a good omen to greet visitors. Perhaps the Nature Center has a greater variety of animal life because of our prairie dog colony, which in their playful way, reminds us of the kids who spend their time there. Like the prairie dogs that are emerging from the ground and bringing new life, soon students and campers will be flocking to the Nature Center, reminding us that it is spring.